QUICK's Standard Clamp Carriers are the most feature-rich and cost-effective Clamp Carriers in the woodworking industry today. 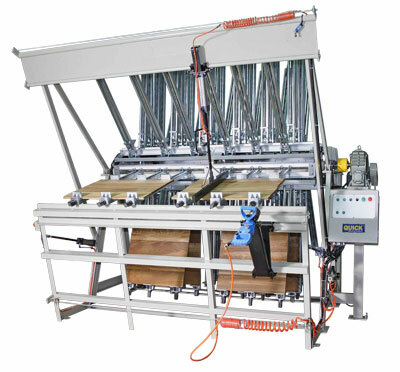 Each of our Standard Clamp Carriers features zinc-plated steel clamps with full box-frame construction and 3/4" diameter full-length screws, super-fast 3500 rpm Clamp Tightener, Pneumatic Panel Flattener and Electric Motor Drive with Automatic Rotation Cycle, which automatically rotates the Carrier from section to section. The 6-Section Standard Clamp Carrier is our most affordable Clamp Carrier. 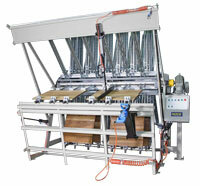 It is capable of clamping up to 150 panels per day. 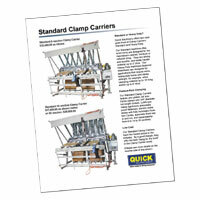 For more information on our 6-section Standard Clamp Carrier, please click on the image to the left. 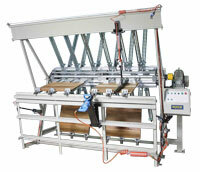 The 14- and 20-Section Standard Clamp Carriers are our mid-size gluing machines. They are capable of clamping up to 300 and 500 panels per day, respectively. For more information on our 14- and 20-Section Standard Clamp Carriers, please click on the image to the left.